The parish of West Walton is situated in the west of Norfolk on the border with Cambridgeshire. It lies north of Walsoken, south of Walpole and west of Marshland St James. The name West Walton may derive from the Old English meaning ‘settlement by the wall’. The parish has a long history and was established by the time of the Norman Conquest. Its population, land ownership and productive resources were detailed in the Domesday Book of 1086. This document revealed that the parish lands were valuable and that West Walton possessed a fishery, a share in a church, numerous salt houses and a large number of sheep. Like other Marshland parishes, much of the ground surface consists of clayey silt laid down in the Iron Age. The watercourses, which drained this silt, now show as low roddons of coarser silt, and the main channels run on a northeast/southwest axis. With this being the case, very little prehistoric archaeology survives, with a copper alloy dagger from the Bronze Age (NHER 2202) and a few prehistoric worked flints (NHER 18600) comprising the earliest finds on record. Roman activity in West Walton is represented by scatters of pottery sherds (e.g. NHER 2203, 19031 and 30047) and isolated coins (e.g. NHER 18973). The main pottery concentrations lie to the southeast (NHER 19030, 19031 and 19045) and central (NHER 18600 and 18602) portions of the parish. However, the most exciting Roman find from the parish takes the form of a coin hoard (NHER 2389) comprising of 664 denarii and antoniniani minted from the reign of Septimus Severus to Tetricus I. This hoard, dubbed ‘Emneth Hoard II’ was probably buried in about AD 270. Few definite Roman features have been identified in West Walton. A number of linear features (NHER 21731) to the southeast, probably ditches, run on a different alignment to the medieval field systems and so are probably Roman in date. Another unspecified Roman feature (NHER 18975) has been reported elsewhere in the parish and a possible Roman or Saxon saltern has been noted by a survey (NHER 19040). All of this evidence suggests that the Roman landscape is well buried under later deposits. As with the Roman period, the main evidence for Saxon activity is gained through analysis of pottery scatters. Scatters of Middle Saxon pottery (NHER 18952 and 25853) around St Mary’s Church (NHER 2210) may suggest a small 7th/8th century settlement existed here. Another area of Saxon settlement has been identified to the south of Ingleborough village (NHER 18943). Excavations here in 1992 recorded substantial Middle Saxon and Late Saxon ditches full of domestic rubbish. Metal detecting also retrieved a Late Saxon stirrup strap mount and an 11th century Ringerike-style mount. The presence of Saxon macrofossils also demonstrates that arable farming was carried out at this site. The growth of Saxon sites can also be tracked by the pottery wares that have been identified. Most scatters of Saxon pottery include both Middle Saxon Ipswich Ware and Late Saxon Thetford Ware (e.g. NHER 18943), suggesting some continuity of landscape utilisation. In addition, metal detecting across the parish has discovered a number of other Saxon artefacts. The most intriguing of these was a Saxon ornament that contained a 3rd century AD Roman coin (NHER 3883). Other finds consist of a Late Saxon finger ring (NHER 18645), hooked tag (NHER 18947) and bridle cheek-piece (NHER 18646) along with a Middle Saxon pin (NHER 18947) and tweezers (NHER 25853). The majority of the archaeological records for West Walton concern the medieval era. The parish appears to have been prosperous and was home to two manors – one belonging to the Abbey of Ely and the other to the Priory of Lewes. In particular the manor house owned by Lewes was of interest because it had its own associated chantry chapel. However, the exact location of these medieval manors is uncertain, with two possible sites suggested for the Lewes Manor (NHER 11959 and 18976) and one for the Ely Manor (NHER 18951). The most likely spot for Lewes Manor (NHER 18976) was identified from a series of earthworks and a moated enclosure to the southwest of Priory Farm (NHER 19103). The land to the north of St Mary’s Church (NHER 18951) may be the most convincing site for the Bishop of Ely's Manor House, as aerial photographs show the cropmarks of a regular moat in this area. Some of this wealth would have come from the salt production carried out in the marshland. As mentioned in the Domesday Book, West Walton had several salt houses (or salterns) and the remains of two such structures have been recorded (NHER 18567 and 18571). Of course it is possible that these mounds relate to sea defences that were erected at a similar time. Other activities to show up in the record include farming and stock keeping. An area of tofts and paddocks (NHER 18580) has been spotted on aerial photographs of the parish and another rectangular enclosure (NHER 18948) could also have served some agricultural purpose. 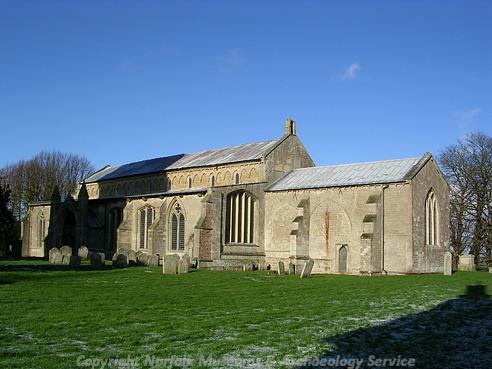 Of course the main area of medieval habitation existed in the area surrounding St Mary’s Church (NHER 2210). 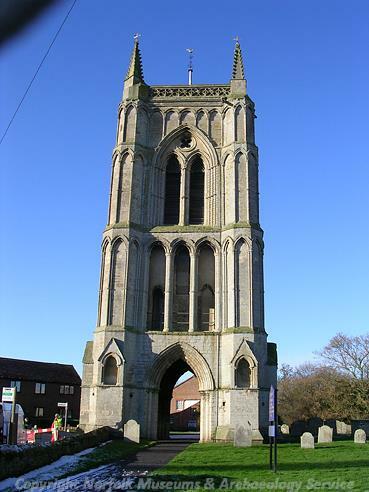 This large church has a grand detached bell tower and dates to around 1340. It reuses some Norman stonework but was altered in the 15th and 16th centuries. Inside, the church contains a number of original wall paintings. Analysis of pottery scatters also shows several other potential areas of medieval activity, centred on Ingleborough (e.g. NHER 18943), Walton Highway (NHER 18603 and 18578) and Walton Fen End (NHER 19072). However, other than the church few other medieval structures survive into modernity. Greenfield’s (NHER 34707), a residential property built in 1821, contains the fragments of a medieval timber frame, but such evidence is rare. The discovery of two stone wayside cross bases (NHER 13395) also suggests that various markers to aid travellers and residents were present in the medieval period. Where they were stationed is not known, as both fragments currently reside in St Mary’s churchyard. A varied selection of medieval finds have been reported for West Walton, in addition to the numerous pottery sherds and coins that have been found through fieldwalking. Finds of note include an iron key (NHER 17409), a boy bishop token (NHER 18948), a crucifix (NHER 25852), padlock fragment (NHER 28453), ampulla (NHER 28758) and gilded buckle (NHER 31174). During the post medieval period West Walton was host to a number of mills. The most notable of these was Ingleborough Mill (NHER 2199), erected in 1824 and standing seven storeys high. 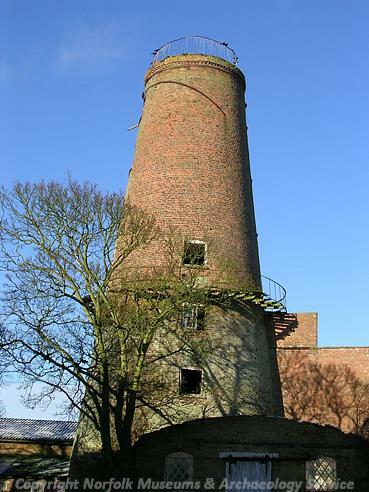 It had its sails removed in 1940 and has now been incorporated into the modern mill that stands here. Another post medieval tower mill (NHER 18478) was situated on St Paul’s Road South. It was built in the mid 18th century but now serves as a house, having been converted and extended. It is also possible that a drainage mill (NHER 16338) existed in the area of Mill Lane. An earthen mound is marked in this vicinity by the Ordnance Survey, although 18th and 19th century maps do not record any mill here. It is also apparent that West Walton was engaged in the manufacture of bricks in the post medieval era. A brick kiln (NHER 36511) and brickyard (NHER 36510) are both listed amongst the archaeological records for the parish. A couple of other buildings were erected during the post medieval period. Intriguingly, a church dedicated to St Paul was built in the mid to late 19th century (NHER 39332). Sadly, it was demolished in the mid 20th century and houses were built over the site. It is worth noting that Fen Road was changed to St Paul's Road not long before the church was demolished. The Old Post Office (NHER 46918) can also trace its origins back to this time, having been built in the early 18th century. It is notable for its thatched roof and dormer attic in a symmetrical arrangement. However, unlike many other Norfolk parishes, no great spate of residential building occurred in the parish during this period. Finally, brief mention should be made of the post medieval finds that have been discovered in West Walton. All of these take the form of everyday items, and those reported comprise buttons (NHER 18645), seal matrices (NHER 18647), pottery sherds (NHER 19960), hooked tags (NHER 25852), tiles (NHER 50207) and knives (NHER 18947). The only record relating to World War Two relates to the crash site of an aeroplane (NHER 18977). This bomber came down in a field to the west of Stratton Farm, but no other details are known. The most recent record for West Walton concerns a Cold War Royal Observer Corps Post (NHER 35434) that stood near to Dixon’s Drove during 1960-68. In 1968 it was demolished at the request of the landowner but the associated Orlit B post was left intact. Thomas Sunley (NLA) 5 September 2007.